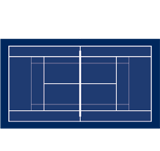 USTA Colorado's Master Calendar provides all dates and deadlines for leagues. Click on the Master Calendar link below. Once you get to the master calendar, click on the boxes along the left to select how much information you would like to see. Along the top, you can change the view. The icon with a "12" on it is the year view and will show you a list of all dates throughout the year for your selected items. Registration opens for all leagues on February 1 every year.